Driving up the road towards the campsite we got our first view; Hen Cloud and The Roaches all in a line, craggy and looking rather prehistoric. What a fantastic welcome to this area we were now so keen to explore. We weren’t too sure where the campsite was but as you drive up the road you come across the farm which has a sign on the gate telling campers that the field is just up the road. We didn’t know what to expect of this site, but pulled up finding a large field with a few tents already pitched. That evening, after dinner, sitting there chatting to fellow camper and climber Jamie it was a stunning night. The air was cold and crisp and the moon was full in the sky. We couldn’t have asked for more perfect weather for the time of year and we were lucky enough that this lasted the entire weekend. Despite having a 3-season bag I did have to test out my fleecy inner liner for the first time on this trip, but then I’m definitely a cold-blooded animal! Will be interesting to see how it goes as we move into December and January. Saturday morning the sun rose in the sky and shone over the now much busier campsite which during the night had become full of climbing enthusiasts. As we weren’t planning to take our packs with us so didn’t need to be careful about weight, we could afford a bit of a luxury weekend so tucked into our full English breakfast while Jamie went off down the road to buy his. Water and other facilities are just down the road at the farm but I will admit we went down in the car! Made me think when I got home and saw one of those charity ads about a small child who walks miles every day to fetch the water for their family. That said we were just being a bit lazy and even without the car this would still have been one of our favourite campsites. If you want to avoid the road, you can get up to Hen Cloud the way we did. In the back right corner of the field is a hump of earth where you can get into the next field. Cross that one and you get out the other side onto the lane, where at the cattle grid you can follow a path up through some wooded ground and out onto Roaches House Lane. Alternatively head up the road to the tea rooms. 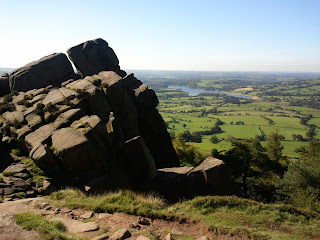 The Roaches on a nice weekend probably isn’t the place to go if you like to be alone with nature as this was definitely (by a considerable way) the busiest walk we have done. 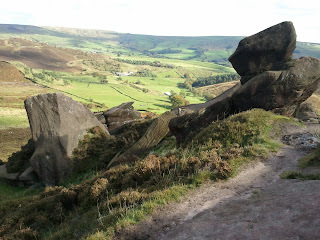 But definitely don’t be put off by this as there is a good reason why it is so busy and why people from all over the world come to The Roaches. 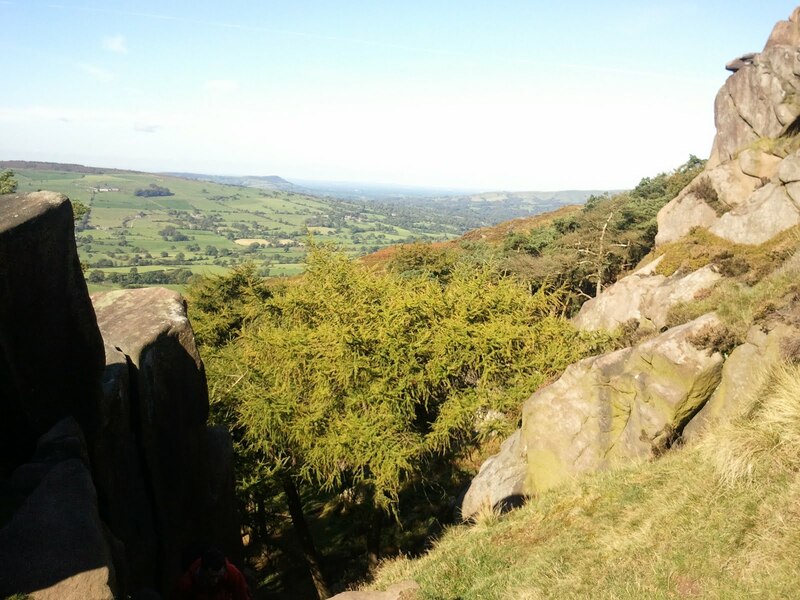 Walking up along the main ridge path, you’re suddenly surrounded by huge formations of grit stone rocks and rock-faces with climbers hanging off. As you walk further you pass another route to the top which comes past Rockhall Cottage and up some steep steps and out to the west views of Tittesworth Reservoir. Next up, right on the main trail was Doxey Pool bright blue and shimmering in the sunlight. On closer inspection though it was slightly murky and I’m not sure I could be lured in by the legendary mermaid (or even a merman!) that is rumoured to live there. Follow the path and you reach the trig point, where we had panoramic views of the surrounding area, being able to see the Shutingsloe (aka the Cheshire Matterhorn for its definingly recognisable shape) and over to the mountains of Wales. 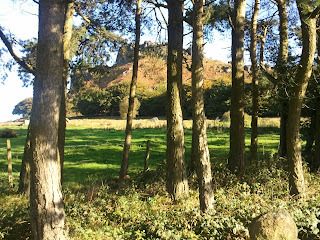 Then a trek down into the woods, past an ice-cream van and onwards towards Lud’s Church. 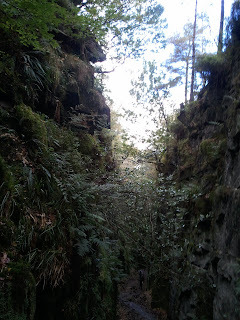 Now, given our usual challenges with paths and maps and the fact that Lud’s Church was on Secret Places of Britain I was fairly sure we would spend hours wandering round and round and possibly end up disappointed. Happily I was wrong; Lud’s Church is actually very well signposted and after avoiding the mud we came to Robin Hood’s secret hideout. For those of you not in on the secret, Lud’s Church is a deep chasm, formed by a massive landslide and historically a place of worship for the Pagans and the Lollards as well as being used as by many legendary characters to avoid the authorities. The original entrances are now closed off to protect them from erosion so wait for the path down the steps into the chasm below. As the light only penetrates the bottom on the sunniest of days the walls are covered in moss, and when the light does shine through it has in places a mystical quality. Perhaps not so secret and hard to find but well worth a visit. 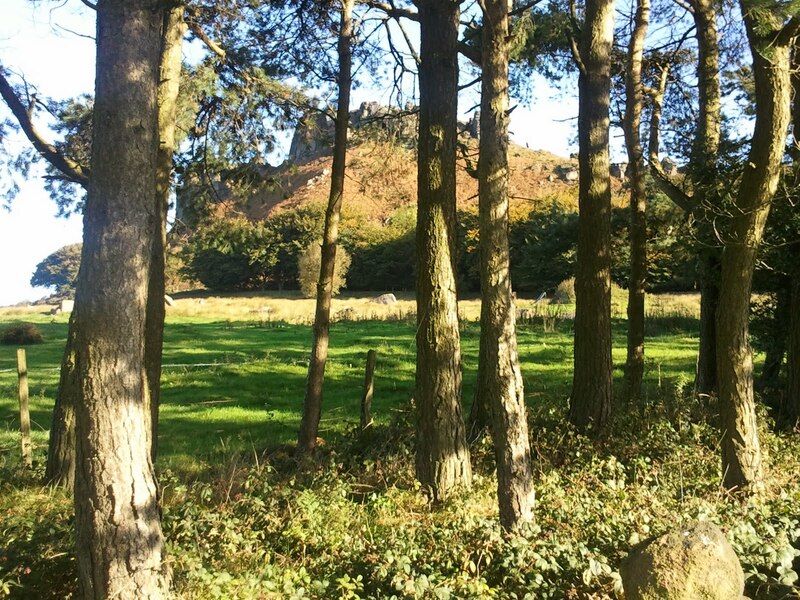 We returned to the campsite, following an alternative and more challenging route back along the Roaches and tucked into some hearty game soup for dinner. After an awe inspiring walk, we’re definitely planning a trip back soon to climb Hen Cloud and to walk the nearby Ramshaw Rocks. Thanks Bobby. 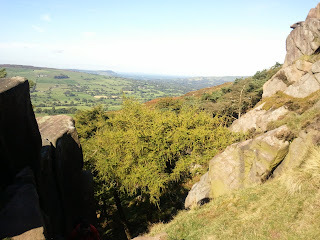 I guess when we set up the blog we were aiming to inspire rather than have other people follow our exact hiking routes. Part of the fun for us is in the planning, getting the maps, searching around for campsites etc. The good news is it seems that we have inspired you and we'll definitely have a look into whether we can add some maps. Not sure whether my artistic skills are up to drawing! but we'll see what can be done. Also check out our campsite page if you've not seen it yet . This has details for all the campsites we've used on our trips.